The annual bonfire is a tradition that has been a part of the Hunterdon Huskies for many years. Held at our home field, usually on the the Friday night prior to our first games, it is an evening full of real Huskies Spirit. There is lots of terrific food, fantastic fun, and of course some great prizes! The Huskies families fill the sidelines and cheer for each of the teams as they are brought on to the field and introduced. Our terrific cheerleaders amaze us with the awesome routines that they have been working hard to put together in what feels like a very short period of time. As the evening winds down and cools off, it is wrapped up with a phenomenal bonfire. 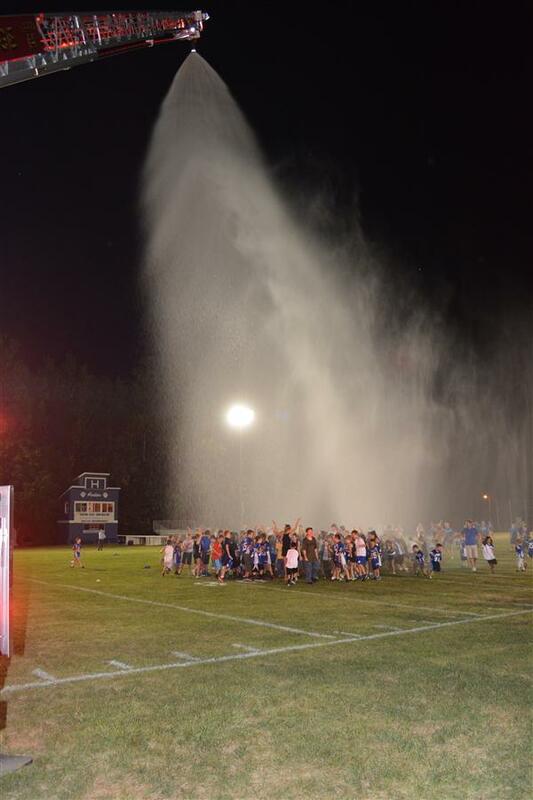 At the 2014 bonfire, the entire Huskies league accepted the ALS Ice Bucket Challenge. Of course there is no bucket big enough to accommodate all our football and cheer athletes as well as coaches so the High Bridge Fire Department was kind enough to help us out by serving as our bucket. The water may have been cold, but all our hearts were warmed by the Huskies Spirit shown in acceptance of this challenge. True Huskies excellence on the field and in the community!